If I were to use one word to describe Harumi Kurihara's second cookbook, Harumi's Japanese Home Cooking, it would be, "essential". It is 160 pages of bliss. Ms. Kurihara's writing is clear and concise, enabling even the most novice cook to delve into the realm of Japanese cooking with the greatest of ease and complete success. Harumi Kurihara has become an icon in Japan, and it's easy to see why. Her detailed techniques and stunning photographs convey her love for cooking and draw the reader in. The book begins with Japanese cooking techniques to help you get started, (and leaves me wanting a ginger grater) and is rounded out with a glossary at the end. Throughout the book there are Harumi's Hints, Ingredients Notes and Menu Planning tips as well as a full section on menu planning at the back of the book and a short, but very informative, section on Bento-or Japanese lunch boxes. There is nothing this book doesn't have to set you on your way to creating beautiful Japanese meals in your own home. Beyond the miso soup variations, my personal list of must-makes includes Japanese Green Tea Risotto, Pork in Crispy Breadcrumbs and Grilled Salmon "Yuan" Style. 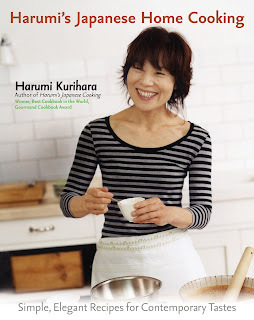 Harumi's Japanese Home Cooking is available in stores on October 2; don't miss the chance to pick up your own copy! Transfer the salmon to a small pan and pour sake on top. Put on stove top on medium heat and cook until warmed through. Flake into finer bits and add the light soy sauce. Turn of the heat and add the sesame seeds. You can either mix them in or just sprinkle on top. Jean-Georges, prolific restaurateur and cookbook author, has written yet another tome. His newest book, Asian Flavors of Jean-Georges, focuses on a cuisine that he has so well mastered and shares recipes from his restaurants--Spice Market, 66, and Vong. I love the website devoted to his many restaurants; the photos are fabulous and each makes me want to travel the world simply to dine at these locations. Don't be fooled, though, by the larger-than-life image painted by his success; he is a self-proclaimed "country boy at heart"--just my type of person. He certainly hasn't lost himself to fame. Jean-Georges' blog, Jean-Georges Vongerichten, chronicles his life, his work and his thoughts on food. It's a wonderful read so far, and I look forward to many more installments. Please give it a read, and don't miss his book, in stores on October 23rd and something I most definitely want to get my hands on. Nothing evokes memories for me quite the way that food does. It has the ability to transport a person to another time and place. The ability also, to resurrect loved ones long since departed. Just the aroma of my great grandmother Barnes' Brown Sugar Cookies transports me to her tiny kitchen in her tiny house in Tipton, Indiana. Visions of her working at the table with her large stoneware bowl dance in front of me with surprising clarity. A single bite of chili, the way dad made it, takes me back to the dining room in the house at Harbor Beach, and calls back my father to the head of the table. Parmesan flavored popcorn, provided by my Uncle Joel and Aunt Sherry, belongs on Route 25 in Port Hope where I watched fireworks as a child on my summer visits to dad’s home . Just the mention of Colby cheese puts me at the large oval table in my grandmother Sharp's kitchen with the sounds of locusts and crickets chirping outside the windows on a hot summer night as I sit, surrounded by my brothers, having a late-night snack. Rice, plain old Uncle Ben's rice, whisks me back to the home of my Uncle Earl and Aunt Mary Jane on the south side of Allentown. Never have I had better rice, and I don't know why ... it must have been the atmosphere. My mother's fried chicken is the taste of home. In an instant I am a teen again, filling my plate to the chatter of my loved ones and friends on Christmas Eve at mom's buffet-style celebration. The enjoyment and satisfaction that comes from eating something I love is magnified when sharing it with someone else, and the memory left is a result of that sharing. This then is my simple truth; food shared is food remembered. "Do not eat garlic or onions; for their smell will reveal that you are a peasant." When I was in culinary school, we were taught to start nearly every savory dish with the almighty trilogy: clarified butter, garlic and shallots. We would spend countless hours peeling and mincing garlic by hand, most often with our chef's knives. I would go home, reeking of garlic, and hoping my husband and two small daughters, wouldn't mind. "No one is indifferent to garlic. People either love it or hate it, and most good cooks seem to belong in the first group." Once our class took over running the restaurant, we would encounter specific requests from customers--no sauce, no salt, leave off the olives--and things of that nature. One night, however, the maître d' walked in and inquired of the chefs on the line which dishes were made without garlic. The normally bustling kitchen came to an immediate standstill as we all turned to stare, open-mouthed, at this ludicrous notion. Our professor looked confused for a mere moment then turned abruptly and started barking orders. Whatever this customer would get, it would be fresh--but sadly, to my palate--tasteless. "There are many miracles in the world to be celebrated and, for me, garlic is the most deserving." I cannot imagine asking for a dish without garlic; in fact, there is hardly a savory dish I make--no matter what the recipe states--without the addition of garlic, and when I realize it is absent from the recipe, I always wonder why. It is fundamental to cooking; it is both complex and simple, making it a truly indispensable food. Food? Yes, FOOD; not herb, accompaniment, spice or seasoning. Garlic is, in and of itself, a highly desirable and much loved food. Italian, French, and German food would be nothing without it. Aioli would cease to exist. The travesty that the world would be without garlic is unfathomable. A day without garlic is like a day without air…if you don’t agree, that’s OK, I’ll forgive you. After all, we can’t all be right, can we? The history of garlic dates back to anywhere between 4000 and 6000 years ago, depending on which source you are using. I would love to think that garlic was growing right alongside the tomatoes and olives that I dream were the first vegetation planted by God. It may be a relative of the onion, it may not have been eaten at first (some wouldn’t touch it beyond medicinal purposes), and some may think it to be “stinking” (poor misguided Henri Leclerc). I, however am of like mind with Louis Diat. I’ll not bore you with details of the full history--you can find that for yourself in a simple Google search--I will, however, share a recipe and a few more quotes with you. 1. Put vegetables in the bottom of a large soup pot and add chicken, unpeeled garlic cloves (a little more than 1 head of garlic) and herbs. Cover with water and bring to a boil. Turn heat to a simmer and cook for 45 minutes or until vegetables are tender. 2. Remove chicken and garlic cloves and set aside. 3. Strain broth and return to pot. Bring to a simmer and cook until reduced by about one-third. 4. When chicken is cool enough to handle, chop into bite sized pieces and set aside. 5. Squeeze softened garlic from skins and add 1 teaspoon Kosher salt. Mash into a paste (a mortar and pestle works well for this) and set aside. 6. Heat butter in a small skillet over very low heat. Add the 10 peeled garlic cloves and cook until cloves just begin to brown. Remove cloves with a slotted spoon and add to mashed garlic and mash these together as well. 7. Add flour to butter and whisk until a paste forms. Add mashed garlic to flour and butter and whisk until well combined. Add all to chicken broth. Heat until slightly thickened and add chopped chicken back into the pot. Season with salt and pepper as desired. "The rabble who had joined the people were overcome by greed, and the Sons of Israel began to wail again, 'Who will give us meat to eat?' They said, 'Think of the fish we used to eat free in Egypt, the cucumbers, melons, leeks, onions and garlic! Here we are, wasting away, stripped of everything: there is nothing but manna for us to look at."